On a steamy hot June afternoon in 1876, Lt. Col. George Armstrong Custer, who graduated last in his class at West Point, rode off into the history books as the commander of the worst U.S. military defeat on American soil. With him were more than 200 soldiers, mostly young Irish-Americans barely out of their teens. They were tired, hungry, ill-equipped and raw—most of them had never been tested in battle before. Waiting for them were upwards of 3000 Indians of the Lakota, Cheyenne, and Arapaho nations, armed with repeating rifles. They had already disrupted the initial attack on their village led by Major Reno at Custer’s behest. Now the Indians turned their attention to the controversial soldier who was arguably the most famous U.S. military commander in 1876. By almost all accounts, the battle between Custer and the Indians didn’t last very long—twenty minutes, maybe thirty at the most. It was a complete rout. Some of the soldiers tried to surrender. Others turned their guns on themselves to avoid capture and torture. Every man went down. Standing near Last Stand Hill on a recent July morning, it is difficult to comprehend this famous battle. What was Custer thinking? He had been warned of the large Indian encampment repeatedly, yet he insisted on dividing up his men into three separate groups and attacking a much larger, better armed, enemy. The debate over Custer’s tactics that afternoon has raged for the last 135 years. 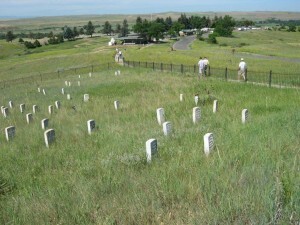 Sadly, visiting the Little Bighorn National Monument fails to yield any concrete answers. There is a small U.S. military cemetery on the grounds (Reno is buried there). Visitors can also attend the obligatory gift shop and the museum which looks in serious need of updating. A 17-minute movie about the battle is screened throughout the day and rangers are on hand to offer guided tours up to Last Stand Hill. Even at 10 a.m. it is becoming stifling hot. The ranger reminds everyone that the actual battle took place between 3 and 4 p.m. How could anyone fight in such blistering heat? Last Stand Hill, where Custer and about 40 of his men went down, is nearest to the Visitor’s Center. The area is fenced off to the public and a large gray monument lists the names of all the soldiers who died. Tourists hike up the hill in the Montana heat to hear the guide describe calmly how Custer’s command crumbled in a manner of minutes. Hearing nothing but quiet that morning, it is hard to imagine the chaos, the clamor, the confusion, the noise. Visitors have a few options. There are pathways that lead all the way down to the river and back, though brown signs warning about rattlesnakes loom everywhere. There is also a paved road that goes right down the middle of the ridge—the battle was fought on both sides. The road meanders for about three miles and connects Last Stand Hill to where Major Reno and Captain Benteen successfully fought off the repeated Indian attacks until reinforcements arrived. A small shuttle bus allows guests to ride in air-conditioned comfort and hear the story of the battle at they go along. Or you can drive you own car, stopping at different vantage points along the way, reading the historic markers that describe the events leading up to the decimation of the famed 7th Cavalry. I had never been to a battlefield before. I wanted to spend more time wandering, taking it all in, trying to understand Custer. But the heat was quickly becoming unbearable and I was ready to leave after only about 90 minutes. Maybe the heat got to Custer, too, that afternoon. Maybe that explains it. Maybe. 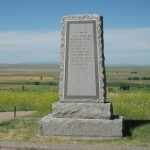 The Little Bighorn Battlefield National Monument opens daily at 8 a.m. Admission is $10 per car. Bring plenty of water. Ah the nostalgia, how I love it. Speaking of haunting places, I have been visiting one year after year although until recently, it’s history was unknown to all, but one. It’s on a beautiful wooded lot of approximately 10 acres in North Smithfield R.I.
Stone walls that define property lines are common in New England. Many are well over 200 years old and they were constructed when the settlers cleared the land to plant crops. They are literally everywhere. This particular property owned by my brother has always been a bit different. There is a large stone walled circle in the forest (about 4’ high) and it’s large enough that one doesn’t necessarily notice that it’s a circle and not just part of another wall. Within this circle are many large mounds of rocks piled upon one another and one would think that they are the result of cleared rocks that never made it to the wall. One of my nephew’s has always known it was a circle and often told stories (since the age of 5) of the Indian Spirits that lived in his woods, inside the circle. Every Christmas, he would take me into the woods to talk to the spirits, he would leave things like holly and berries and he would show me the new arrowheads he found. We all passed it off as a child’s imagination as arrowheads are common in New England, that is, until someone came along wanting to purchase and develop some of the land and that’s when an archeologists along with some historians got involved. Needless to say, my nephew was right! This land will never be developed, these stones are monuments to deceased Indians who died in King Phillips war. They are buried in mass under the large piles of stones within the circle. When these facts came to light, my nephew Andrew said, “see I told you” and “why couldn’t we all have just have got along, they were nice people, you know”! It’s the fog of war and not knowing the size or complexity of the adversary. I once ready that General Custer used techniques very effective for him in the Civil War but completely inadequate against a better armed superior force. Of American Battlefields, probably Vicksburg is the most striking to me as a large force of Union soldiers had to scale a cliff to reach the well entrenched defenders. Another example of old tactics facing newer technology. 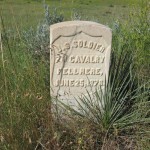 A name familiar to us, Cornelius Miller, died of his woulds traveling by riverboat back to the north after the battle. A very haunting place for anyone to visit.